Please help us welcome new Denver Mayor Michael Hancock, who will give the opening "kick-off" lunch speech for our City Club program year. The Mayor will discuss the challenges of leading the city during the economic downturn, selecting members of his cabinet, and working on complex civic issues such as the proposed relocation of the National Western Stock Show. 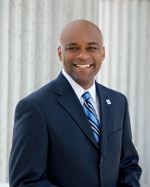 Mayor Hancock, having taken office in mid-July, will provide an update on his vision for the City of Denver.